Turn to any page of the recently published, two-volume, folio-size Catalog of the Cotsen Children's Library: The Nineteenth Century -- say, page 24 of volume II -- and the bibliographical detail accompanying each entry and illustration are case studies in thoroughness. In my case, page 24 reveals a charming, full-page, illustration of Theodore Léfèvre's Bébé saurait bientôt lire (approx. 1880), a hand-colored wood engraving frontispiece for an elementary reader. 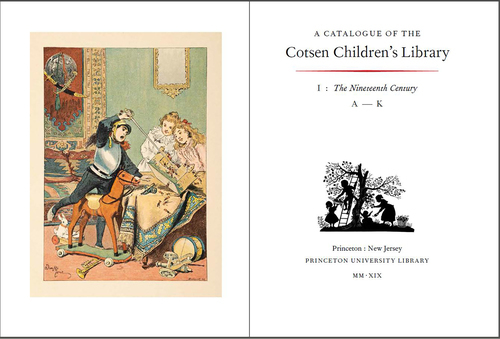 This project didn't come together overnight; for over twenty years, a team of dedicated librarians and staff at the Cotsen Children's Library at Princeton University have been fastidiously compiling a complete catalogue of that library's research material. To put it mildly, this has been no small undertaking. Out of the nearly 100,000 items donated by Princeton alumnus ('50) and Neutrogena executive Lloyd Cotsen, 23,000 non-circulating items spanning the 15th through the 20th century and written in thirty languages will ultimately be included in the multi-volume compendium. Included in the Nineteenth Century are descriptions of 6,370 children's books in the library's holdings and 270 full-color illustrations. Titles were selected for this publication based on their illustrations or their representation of a particular style or development. As the focus is on the 19th century, work by well-known illustrators like Charles Perrault and Kate Greenaway figure prominently, as do examples of then-revolutionary printing and illustrating techniques. These lavender, gilt-stamped cloth volumes are arranged alphabetically, with each entry given meticulous bibliographic detail. The pair is being sold through Oak Knoll Press for $250. 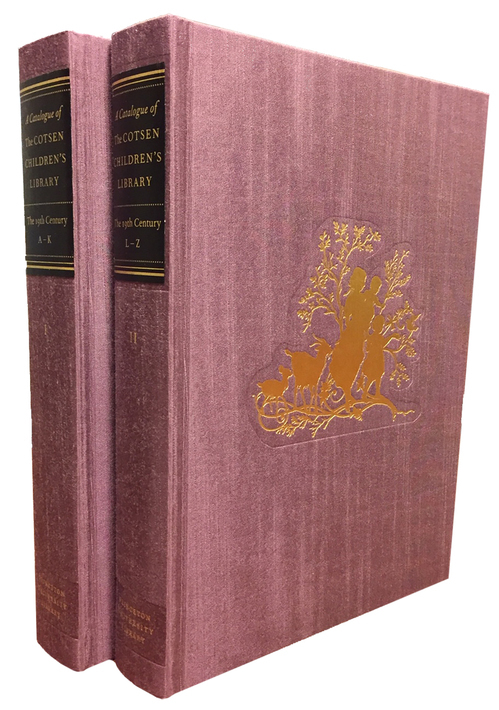 Nineteenth Century joins the Cotsen's earlier two-volume catalogue, published in 2000 and 2003, chronicling the library's 20th-century holdings. A final, two-volume project is in the works that will examine the Cotsen's children's books dating from the 1400s through 1801. Among some of the treasures in the Cotsen's holdings include picture letters by Beatrix Potter, incunables, drawings by Edward Lear, and even an early-Coptic schoolbook. Though the Cotsen collection is non-circulating, the library hosts an array of impressive virtual exhibitions using its holdings.